We have made a lot of progress on stabilizing the Snickersville Academy, Bluemont's first school, built in 1825. Be sure to visit us and see for yourself during the Bluemont Fair, September 15-16. UPDATE! September 1, 2012. 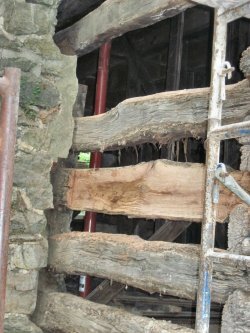 With the expert guidance of knowlegeable Erik Westergard, a delicate process began in May to level the floor of the Old Schoolhouse and to repair or replace some logs in the much-weathered south wall. Right: Standing by one of the orange house jacks, Mark Zalewski points to where damaged logs will be taken out and 20-foot logs will replace them. Note charred log upper right. Investigation inside the south wall has discovered a major cause of weakening of that wall--a severely charred log evidencing some old fire damage, which probably occurred when people at some point tried to vent a cast-iron stove through the old chimney. Luckily the fire apparently went out before it consumed the entire structure. However, the stress was apparently enough to damage the south wall. The first step in investigating the cause of the sloping floor on the north side of the building was to open the floor to gain access. We found that a few of the stones supporting the floor joists in the northwest corner have moved over the century-plus, removing solid floor support. We placed temporary jacks under the joists to aid in the replacement of permanent stonework beneath them. We have also removed some of the stone above the fireplace to allow proper access to the damaged chimney and to expose the logs that extend the entire width of the cabin in front of the chimney. Slowly, the south facing log wall will be jacked up to allow for removal of three time-worn logs and to fit new logs in the joinery style of 1825 log cabin corner joints. We carefully braced the structure on the inside as the work on the south wall went on. "new" (actually, old) 20-foot logs salvaged from another structure built at about the same time. The log work on the south wall is complete. We replaced three complete logs and faced seven others. All of the chinking and daubing on the south wall has been removed. We power washed the south wall and then sprayed it with BoraCare (an insect and fungus repellent). The next phase of work will be to replace the chinking and daubing. Now that we have exposed the entire south log wall down to the foundation, we can see that the log cabin has moved over time about six inches nort,h which explains why the floor is somewhat spongy in areas (little to no floor support on south and north). Eric Westergard and Ed Ashby are investigating the possibility of moving the entire cabin back (south 6 inches) onto its original southern foundation and repairing the bulge in the north foundation . This task will fit into our existing plans, since the bottom logs on the west and east walls will need to be repaired or replaced in any case, and this could be part of the repositioning of the cabin. What all of this means for the Bluemont Fair is that the chinking and daubing will be in place at all of the corners of the log walls, but there may be open spaces between the logs in the main section of the south wall between the chimney and the corners. The corner chinking and daubing will give the building strength on all the corners. We will, however, be able to remove the metal piping internal braces and get the Academy in shape to welcome curious visitors by the date of the Fair. Keep up with our progress on Bluemont's first school. Read the Summer 2012 issue of our newsletter on the Snickersville Academy and life in Bluemont: The Log Book.